A handful of bean sprouts, washed. Begin by preparing all of your vegetables. Place your handful of washed bean sprouts into a bowl, before chopping the spring onion into fine matchsticks and placing them on top. Then, finely slice your carrot, Chinese leaf and red pepper, as well as peeling and roughly chopping the garlic. Time to build your wok clock! On a large plate, place the chopped garlic at 12 o’clock, and then arrange the carrot, Chinese leaf, red pepper and bowl of bean sprouts and spring onion clockwise around the rest of your plate. Leave to one side. Moving on to your meat, place the pork mince in a large bowl and add all ‘The Marinade’ ingredients, massaging them thoroughly into the meat. In a separate bowl or ramekin, combine all of ‘The Sauce’ ingredients together, making sure to mix well in order to dissolve all of the palm sugar. Let’s get ready to wok! Bring your wok to a high heat and add a drizzle of vegetable oil, swirling it around the wok until it reaches smoking point. Then introduce the pork mince, separating the meat with the side of your ladle or spoon and allowing it to cook through for approximately 3-5 minutes. (Hint: reduce the heat of the wok if your meat starts to catch and burn). Pushing the meat to one side, add the garlic to the centre of your wok, quickly followed by the carrot. Allow to cook for 1 minute before adding the pepper and Chinese leaf and folding the vegetables through the mince. Back on a high heat, pour your sauce over the full wok and stir fry for just 2 minutes. Then switch the heat off and fold the washed bean sprouts and spring onion through the rest of the pork and vegetable mixture, allowing the residual heat of the wok to wilt the bean sprouts slightly, without them losing their crunch. Once the mixture is completely cooled, begin the wrapping process. Lie one sheet of spring roll pastry down in a diamond shape in front of you, and spoon 1-2 tablespoons of filling into the centre of the diamond’s lower half. Fold the bottom corner of the spring roll pastry over the filling then, holding your fingertips over the covered filling, use your thumbs to roll the pastry over once or twice to continue encasing filling and create a tight cigar-like roll. Now about half-way up the diamond, tightly fold in both sides to create an envelope-like shape. Use your half banana like a pritt-stick or UHU stick to cover the top of the envelope shape, then continue rolling up the pastry until the roll is completed. Repeat until all the filling is used, or you reach your desired number of spring rolls. (Hint: you can use egg wash instead of banana if you wish). Finally, time for deep-frying! First, line a large bowl with paper towel and leave near to hand. Then, half-fill your wok or deep-fryer with vegetable oil, and heat to 170C. Test the temperature of your oil by placing the tip of a wooden implement, such as a skewer or chopstick, into the oil: if the wood begins to slowly fizz then the oil is the right temperature, an immediate fizz shows the oil is too hot. Once your oil is at the correct temperature, introduce your first batch of spring rolls, being sure not to overcrowd your wok. Keep the oil bubbling at a medium heat and allow your spring rolls to deep-fry until the pastry is crisp golden brown, about 3-4 minutes per batch. Transfer the cooked spring rolls into your lined bowl to dry, and then repeat the process until all your rolls are fried. 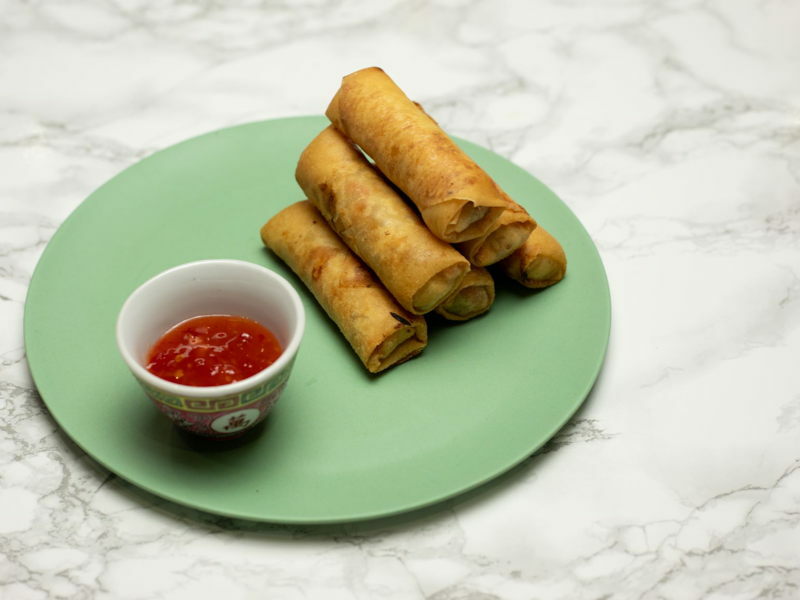 Arrange the finished rolls on a plate, and serve alongside a bowl of sweet chilli dipping sauce, if desired.